What a beautiful little girl! Thanks for sharing about this. She. Is. Beautiful! Her eyes get me too, probably because they look similar to my own three. I imagine her family is just as grateful for you’re family listening to God in choosing her. Sweet girl! Beautiful, her, you, your family, beautiful!! How Awesome! My family and I lived in Honduras for seven years. My husband actually grew up there. It was so hard to see the extent of poverty there. I actually became very overwhelmed because I wanted to help everyone. We ended up kind of “adopting” a homeless boy. He still remembers us and even looks for us when we travel back to visit. It always touches my heart when I see a Honduran child being helped and loved on. I took a moment to read this while at work. Bad move! Now I’m sitting at my desk with teary eyes. We sponsored a little girl through World Vision for several years. 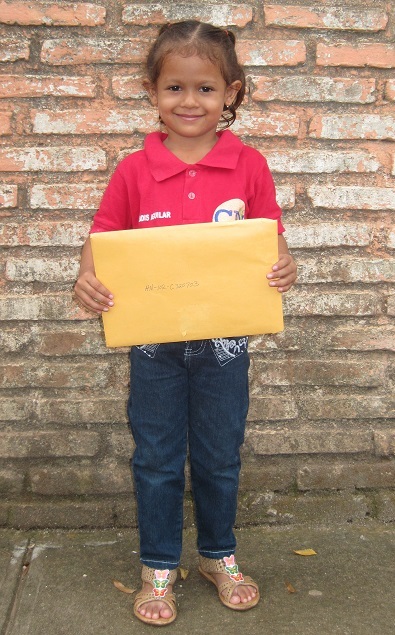 We sponsor a Mexican boy through “Christian Foundation for Children and Aging”. He frequently sends us artwork which ends up on our fridge as well. OH, a new great-niece for me to love on, too!!! 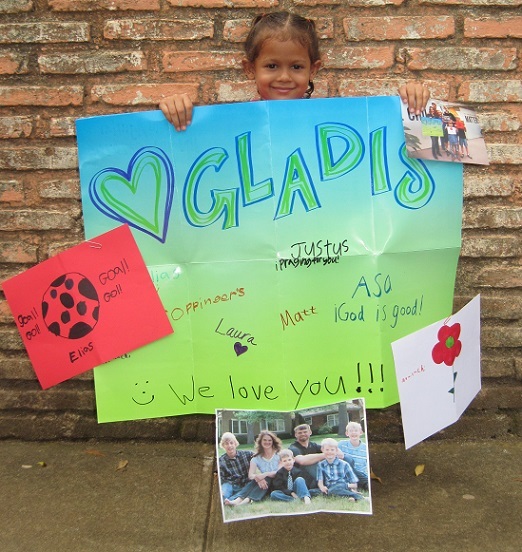 Welcome to your extended prayer family, Gladis!!! Thank you so much for sharing this! My husband and I talked with our children and decided to support this ministry this evening- we all agreed to choose a little 3 year old girl named Katherine from Nicaragua. She was born just days apart from our youngest daughter! She is absolutely beautiful and we cannot wait to start ministering to her and caring for her through our prayers and donations. Thanks again for sharing this wonderful ministry! We have a young friend named Griselda in Guatamala. …and that is a big poster…what a great idea. As I was reading this post and saw the picture of Gladys I thought, “That little girl looks Honduran.” My husband is Honduran and we lived there for the first 4 years of our marriage. Our oldest child was even born there. Honduras holds a special place in our hearts! There is so much need in Honduras. Thank you for helping this little girl.